Although it's probably not the Coolest Stang' on The Block right now? 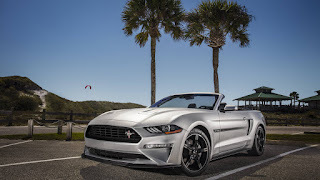 Having just heard, but not seen the new for 2019 Bullitt edition Mustang going on sale this summer to commemorate the 50th Anniversary of the movie. or better known as the California Special isn't new to any of us FoMoCo' Aficionados. Knowing that 'Ol Shel', aka Carroll Shelby previously sprinkled his Snake Oil; Err Charm upon the original for Ford Wayback in 1967. Well Ok, it was actually Shelby's prototype 'lil Red '68 Shelbyy GT-500 Coupe which served as the inspiration for the eventual '68 Mustang GT/CS's cars. Which were produced solely for the California marketplace. With local Dealers hoping to sell an estimated 5,000 units, but less than 4,200 were ultimately built. Then again, what better car than a brand new Mustang GT/CS convertible to go 'N "Get lost in The USA."